Scholarships – LA Kelley Communications, Inc.
Empowering yourself to design and elevate your life requires education. The hemophilia community is fortunate to have abundant scholarships available to current and future college students with bleeding disorders to help them get the education they need to live the lives they dream. For Scholarships for international students, please visit www.saveonelife.net. Full-time or part-time students of any age with hemophilia B, who are pursuing post-secondary education (undergraduate, graduate, doctoral, trade schools, and certifications). Potential candidates must sign up at https://www.ixinity.com/community for more information. Brothers Healthcare will donate $2,000 per year to be awarded as two $1,000 scholarships to people whose lives are affected by inherited bleeding disorders like hemophilia or Von Willebrand disease. The scholarship program is open to people with hemophilia A or B (factor VIII or IX deficiency), including those with inhibitors (factor VIII or IX deficiency),or von Willebrands Disease, regardless of which brand of treatment they use. The program provides financial aid for a wide variety of educational options, including four-year bachelor’s degrees, associate’s degrees, technical/vocational certifications, as well as the GED Test. Candidate: Persons who have been diagnosed with an inherited bleeding disorder, have volunteered time and energy to any organization within their community, and are entering or attending an accredited 2- or 4- year undergraduate institution in the United States to obtain their first undergraduate degree. Persons affected by a bleeding disorder including anyone who: has been diagnosed with a bleeding disorder; is a caregiver of a child or adult affected by a bleeding disorder; has a sibling or a parent in the same household affected by a bleeding disorder. At least one scholarship will be awarded to an applicant pursuing education in a health related field. Florida resident with a bleeding disorder attending a college, university, or trade school. Students with hemophilia or a related bleeding disorder, or their family members. Must be citizens of the United States and enrolled full-time in an accredited two- or four-year college program. Individuals within the bleeding disorders community who reside in the state of Michigan seeking a post-secondary education, which can include a community college, university, graduate level or trade school. This includes those with bleeding disorders (clotting disorders are not eligible for this scholarship) and immediate family members (parent, sibling, grandchild) of those with a bleeding disorder. Past applicants are eligible to re-apply. Candidate: Students with bleeding disorders seeking post-secondary education from a college, university, or trade school. Immediate family member of a person with a bleeding disorder (may or may not have a bleeding disorder themselves), seeking post-secondary education from a college, university, or trade school. Candidate: Student pursuing a degree in the medical/healthcare services field. Must have or be related to someone in their immediate family with a bleeding disorder. 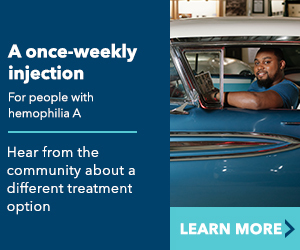 Person with hemophilia A or B, who is either a high school senior with aspirations of attending an institute of higher education (college, university, or vocational-technical school) or a college student already pursuing a post-secondary education. provided by your clinician or HTC.